Need a little afternoon pick-me-up to get you through the rest of your day? Or how about rewarding yourself with something a little sweet... Now through Valentine's Day, when you buy a Vanilla Spice Latte, Caffè Mocha or Hot Chocolate after 2 p.m., Starbucks will give you a second of equal or lesser value absolutely free. We don't visit Starbucks often, but my kids love hot chocolate so I will be taking them in for a sweet treat to celebrate their amazing grades on their report cards that came home this week. Straight A's deserve a special reward! 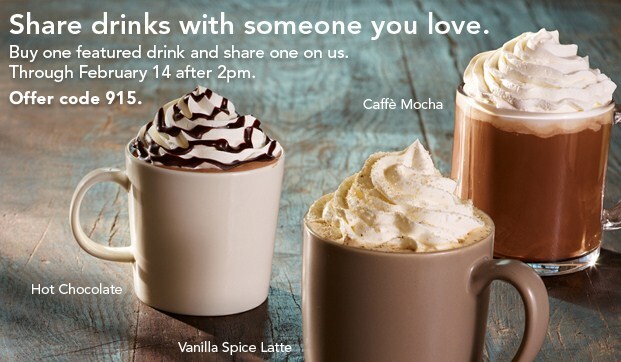 Print or show this free Starbucks offer on your mobile device. What is your favorite drink at Starbucks? Valid through February 14, 2013. Exchange this coupon for one free Vanilla Spice Latte, Caffè Mocha, or Hot Chocolate with the purchase of equal or greater value Vanilla Spice Latte, Caffè Mocha or Hot Chocolate. Limit one per person. Offer good only at participating Starbucks stores in the US while supplies last. Void where prohibited. Cannot be combined with other offers or discounts.